Description of decorations: Beige gray sand, rounded beige gray stones, driftwood, branches, leaf litter. Description of equipment: External filter Eheheim Classic 2217, air pump Tetra APS 300, Tetra Tetronic LED, JBL ProTemp S 200 W.
Water parameters: pH is 6.5, GH is 6, KH is 4, water temperature is 25°C. Description of the area surrounding the biotope: Crater Lakes is a National Park in Queensland, Australia. It includes two lakes of volcanic origin: Lake Eacham and Lake Barrine. Also this park is a part of the area called “Wet tropics of Queensland”, a UNESCO World Heritage Site. Lake Eacham is smaller than Lake Barrine, it is 840 m long and 720 m wide, the surface area is 0.52 km², and the maximum depth is 66 m. The lake takes water from underground sources that maintain the water level, however the water level can fluctuate up to 4 meters between rainy and dry seasons. Due to its volcanic origin and underground sources, the water is rich in minerals and has a blue hue. The shores of both lakes are covered with a humid tropical forest, represented by a wide variety of trees, monocotyledons, ferns, mosses, and there are also some types of liverworts. Also the shores are inhabited by a large number of mammals, birds, reptiles, amphibians and insects. The lake is open for tourists, it is allowed to swim, sail on canoes and motorless boats, there is a path to the water and a picnic area. Also, the lake is popular for diving. 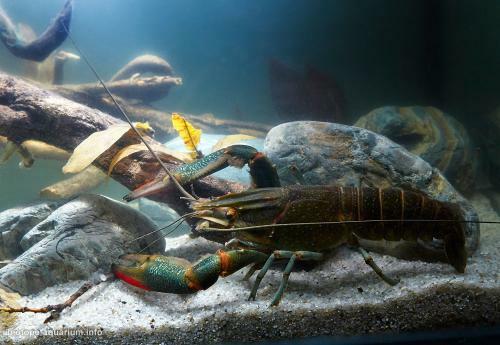 Description of the underwater landscape of the biotope: The lake was formed as a result of the so-called steam explosion, it is deep enough with a small surface area. Its water has a blue colour, its transparency depends on the season. In the coastal zone flooded coastal plants can be found. The bottom of the shallow water is densely covered with fallen leaves, aquatic vegetation does not appear to be found in Lake Eacham. At greater depths, whole fallen trees are more common, already rotten in the middle, and covered with algae outside, which now serve as an excellent shelter for red claw crayfishes and few fishes. Also the bottom is covered with rather large stones of volcanic origin. Their affiliation to any particular rock is difficult to establish, since they are covered with a layer of silt, like everything at the bottom. Sometimes you can see the remains of small animals that fell into the water. Also there are objects of anthropogenic origin there, such as boats. Description of the parameters of the habitat: Lake Eacham was formed about 10,000 years ago as a result of the so-called steam explosion and is surrounded by a crater that prevents water from other rivers and streams from entering the lake, thereby maintaining cleanliness and constant mineral composition of the water. Some of the water from the lake pass the crater wall, and a part of the water evaporates. The lake gets water from underground springs that allow to maintain a constant water level. The water level varies only four meters between rainy and dry season. The warmest time is in December, February, and March. At the same time, the sunniest month is October. the rainy season lasts from January to March. In January and February the water temperature is around 28°C. The least precipitation there is in August. The coldest months are June and July. Some parameters of the water at a depth of 10 m are also known: Eh (mV) 425; O2 in solution is 11.2 C; Ca is 2.7 mgL, Mg is 2.2 mgL; Na is 3.1 mgL; K is 0.5 mgL; HCO is 27 mgL; SO is 1.2mgL; Cl is 3.3 mgL; SiO2 (react) is 1.5 mgL; Fe (total iron) is 0.1 mgL. List of fishes and invertebrates occurring in the nature biotope: Glossamia aprion, Toxotes chatareus, Nematalosa erebi, Amniatabe percoides, Cophixalus ornatus, Austrochaperina fryi, Litoria genimaculata, Cherax qadricarinatus. 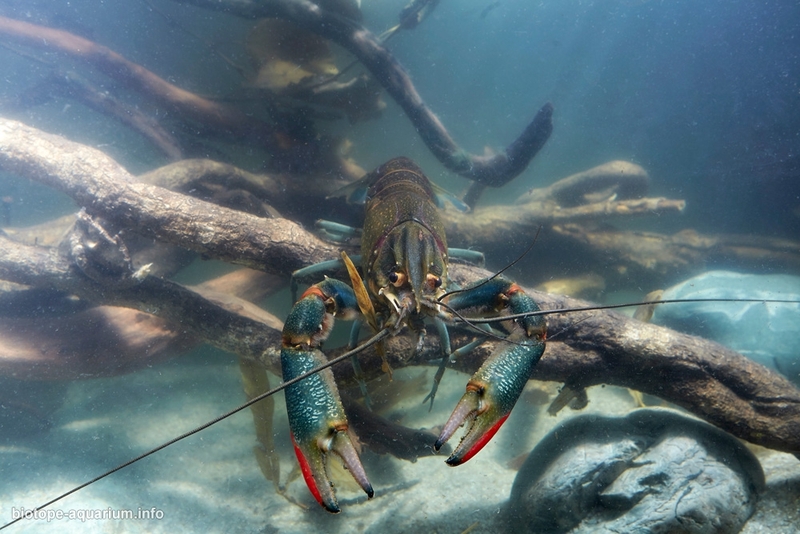 Threats to the ecology: by invasive species. In 1978, Melanotaenia eachamensis was discovered in the lake. This species was described in 1982, and is recognized to be endemic to Lake Eacham. A study of the lake in 1987 showed that this type of rainbow fish was no longer in the lake. This is associated with appearing of such fishes as Glossamia aprion, Toxotes chatareus, Nematalosa erebi and Amniatabe percoides, which were not in the lake before. 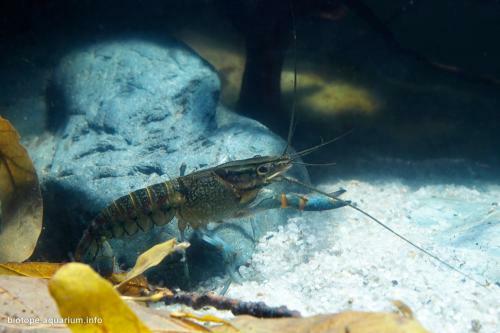 But the rainbow fishes remained in aquaria, they were successfully bred and reintroduced into their native lake. But the attempt failed. Later on, the rainbow fishes of Lake Eacham were found in other water bodies of the Wet Tropics: Dirran Creek and Lake Euramoo. Some populations had pure genetics, some were crossed with local species. 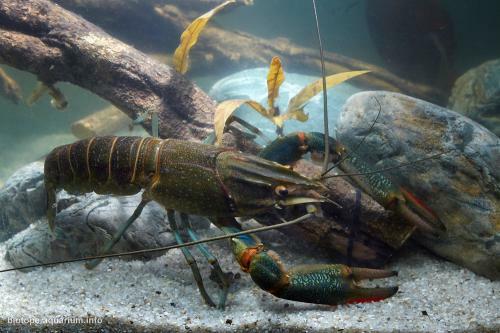 Also in the lake there are Australian red claw crayfish Cherax quadricarinatus, which is an invasive species. It is distributed in tropical and subtropical climates, as it does not withstand a long temperature drop below 10°C. In areas where this species has been introduced, it can affect the local fauna through direct competition, predation, habitat modification or the spread of previously unknown diseases and parasites to local populations. It is an object of aquaculture due to high growth rates and resistance to fluctuations in water quality. 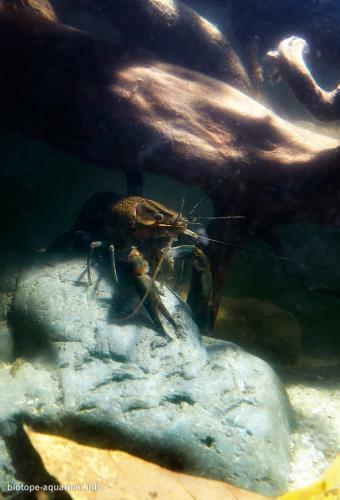 The crayfishes are also found in home aquaria, due to the variability of their colour. The colour of the crayfish depends on the chemical composition of the water. The more minerals are dissolved in water, the more saturated is the blue colour.